Beautifully engraved certificate from the Mercantile Library Company of Philadelphia issued in 1863. This historic document has an ornate border around it with a Civil War era Tax Stamp. This item is hand signed by the Company’s President ( T. Morris Perot ) and Treasurer ( A. L. Fehworth ) and is over 140 years old. PEROT, Thomas Morris, merchant, born in Philadelphia, 8 May, 1828. He is the grandson of Elliston Perot, a noted Philadelphia merchant, and a descendant of Anthony Morris. 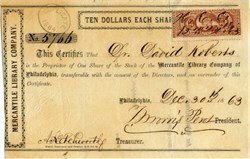 He early entered the retail drug business, subsequently was graduated at the Philadelphia college of pharmacy, and in 1850 established himself in business as a wholesale druggist and manufacturing chemist, in which he has acquired wealth; but he is more widely known for his philanthropic works. In 1861 he was the president of the Mercantile library company of Philadelphia, and under his administration its library of 22,000 volumes has grown to 160,000. Mr. Perot bore an active part in founding the Woman's medical college in Philadelphia, the first institution of the kind in the world, and has been for many years its president. Since his youth he has been connected with various charitable institutions, and he is now in the directorship of many such in Philadelphia. He had been active in the struggle for reform in municipal affairs, was one of the organizers of the first Citizens' reform association, and became one of the original members of the Committee of 100.